We take for granted that many English words have counterparts that sound related, but aren’t. Even though know and no sound the same, their meanings are so different we assume they have different etymological sources (which the spelling differences also suggest). However, sometimes words we might not expect to have anything in common historically do in fact go back to the exact same source. They’re called etymological doublets; here are 15 of them. 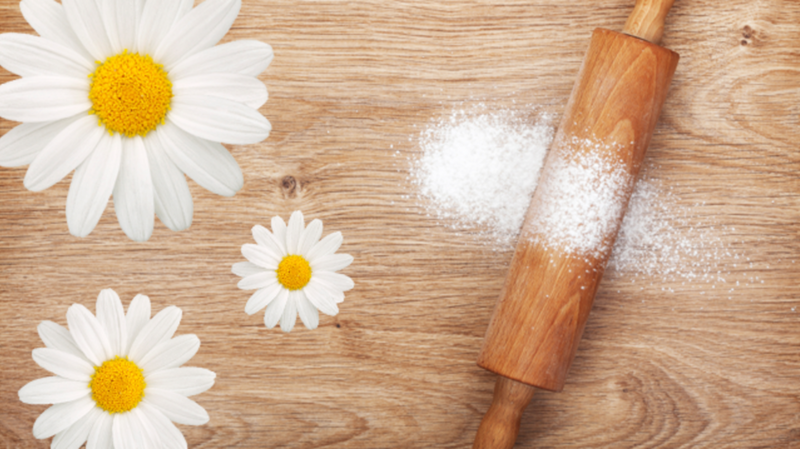 Flour, just like flower, came from French fleur. It was named that way because the part of the plant used to make it was considered the “flower of the grain,” the best part of it, taking away all the chaff and other impurities. Both go back to Latin locusta, for locust, which also turned into langouste and Old English lopustre. The lobster is the locust of the sea. Though one measures length and the other weight, they both go back to Latin uncia, meaning a twelfth part. The original ounce was 1/12th of a pound. Of and off were the exact same word but in a stressed vs. unstressed pronunciation. It wasn’t until the 17th century that they developed different uses to the point where they were considered different words. Etiquette was a French word for a note attached to something that listed its contents. It was borrowed into English as ticket and into Spanish as etiqueta where it came to be associated with the listed rules of protocol for the Spanish royal court. It then came back into French and English with the social protocol meaning. Both come from Latin consuetudinem, meaning accustomed to, habituated. Both referred to the general habits of a group, including how they dress, among other things. Costume wasn’t explicitly connected to just the dress sense until the 1800s. Both come from Latin specie, for appearance or form. Spice came into English first, from Old French espice. Species was later borrowed directly from Latin. In Anglo-Norman reward and regard were alternate pronunciations of the same thing. While the g version took on the senses of "to look at," "give attention to," and also "to merit, esteem, or respect," the w version settled into the current sense of giving something on merit. Latin dignus meant worthy. While dignity refers to a sense of worthy that includes serious notions of honor, respect, and rank, in dainty, dignus lives on in the sense of being worthy for being delightful, precious, and pleasing. Both come from Latin nativus, meaning innate, natural. Naïve is natural in the sense of being unspoiled and native is an innate belonging to an origin. The ancestor of Old English scyrte developed into a word for the upper part of an undergarment in many Germanic languages, but it’s not clear how it also developed into the skirt word for a lower garment in English. Possibly through a term for apron. Tradition is from Latin tradere, for the act of handing over or handing down. Treason also comes from tradere, with the sense of handing over or delivering. The tray in betray also goes back to this sense of tradere. Both are approximations of the Persian word for turban, dulband, which a tulip was said to resemble. Maneuver comes from Latin manu + operari, to work by hand. But so does manure, which was originally a verb meaning to till the land. Grammar goes all the way back to Latin and Greek where it referred to all aspects of the study of literature. In the Middle Ages it came to be associated with just the linguistic parts and particularly with the study of Latin. The fancy, educated class studied Latin, and also things like magic and astrology, so the word grammar sometimes referred to that aspect too. A mispronounced version, glamour, went on to stand for the magical, enchanting quality we use it for today.